Ribbon embroidery flowers are one of my favorite needlework crafts, and I have made just about all of them. The gathered silk ribbon embroidery flower is a common one, and we have made a few--certainly enough to teach the class. Small ribbon embroidery flowers can be made of 3/8 inch ribbon and it takes a minimum of about 2 1/2 linear inches to make little flowers. We sew the ends together before we start, then use a running stitch to sew one edge of the ribbon all the way around. Pull it as tight as you want the flower to be and make a few stitches to secure the gathers so they will not come out. You can make two of these and put them together for more fullness--and you can see we put a green one behind a pink one just to show how. 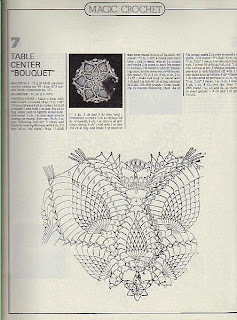 Sew these flowers onto the design you are working. If you need larger flowers, use about a 4 inch piece of silk ribbon and gather it. Place it behind the smaller flower petals to design a larger flower. These gathered ribbon embroidery flowers are pretty with seed pearls worked in the center, or other tiny beads, or even a single sequin on the small ones. Be creative with ribbon embroidery and make beautiful pillows, wall hangings, or even a purse. Backgrounds can include velvet or velveteen, moire or felt. Fleece looks pretty for items that are not washed, but I have not found fleece to be a good fabric for washable items, since it is made with a foam on the inside that is not very durable. Needlework crafts are a great pleasure if you like to sew by hand, and there is so much to learn, and there are so many new things to try out. Ribbon embroidery is one of my favorites, but I try to share other crafts with you, too. If you have leftover yoyos from quilting crafts or if you find some at the thrift store (which I have done before), you can put them to great use for crafts projects. Yo-yos make great fabric pictures and faces for people. They also make the sun and moon. Of course they make flowers, either in singles or multiples. 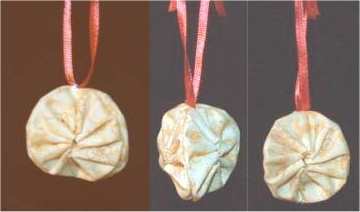 We have used yoyos for different Christmas ornaments, and they make a beautiful garland for the Christmas tree, too. Fabric pictures or wall hangings are great ways to use the extra yoyos, and once you get started, you will think of all kinds of ideas. I saw a purse made of yoyos the other day. It had yoyos attached to a fabric, with a lining fabric.The crafter used purchased wooden handles. Have fun making crafts with leftover or recycled yoyos. See you soon with more needlework crafts fun. Crocheting is a needlework craft that many of us really like to do in our spare time, and making an afghan is one of the easiest crochet projects. Making an afghan square is another issue. 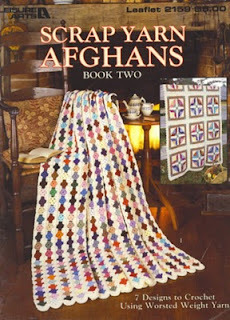 I have made several afghans in my lifetime, and a few have been more like a trapezoid than a square or rectangle. The afghan gets wider as it gets longer, and it took me years to figure out how to overcome this crochet problem. Frankly, it was embarrassing that an afghan was such a simple crochet project, and that I could not get it right. I have made crocheted baskets and a hundred doilies, crocheted lace by the yard, and still could not figure out how to make an afghan correctly. Well, it is so easy a caveman could do it, but it takes two sizes of crochet hooks--one the size you are going to make the afghan with, and another one a size larger. 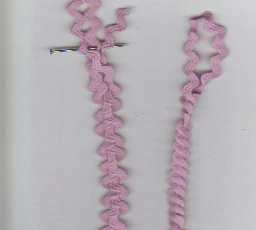 Use the larger hook to make the chain and first row of stitches. Then, work the afghan with the smaller size hook. Would you like to crochet but just cannot learn to follow the instructions? There are crochet patterns available to help the visual learner, with pictures of the crochet. 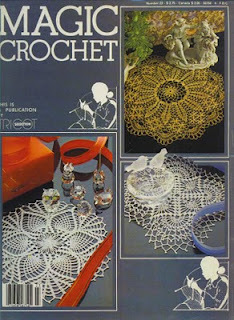 These are Magic Crochet magazines that are no longer in print, but are still available on the internet. If you have struggled with crochet before and thought you couldn't do it, you may like to try it again. It really is a fun needlecraft that can give you hours of pleasure. See you soon with more needlework crafts, sewing and stitching fun. 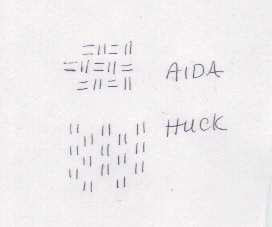 You can do Swedish weaving on Aida the same way as working with Huck Toweling. Just pick a design and get started. 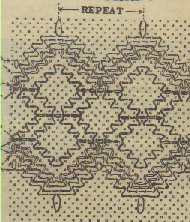 Enjoy free crafts ideas from my half a century of learning needlework crafts. You can subscribe to this blog so you know when I have a new project for you--usually every week. We like to share. Make Rickrack braid from left-over rickrack. We have rickrack from years ago when it was popular. Confession here. It may be forty years ago, or more. I'm not counting, and hope you won't either. Anyway, we have lots of rickrack in different sizes and colors, and it not only is making a comeback in crafts, it is versatile and downright attractive when used as braid. We learned to braid rickrack many years ago, and I'm not sure many crafters still know how. We do the two-part braid and the three-part braid. This is fun and an old needlework craft that you can teach others. Rick rack braid looks nice on just about anything that any other braid works on, including clothing, place mats, doll clothes, Christmas stockings and holiday crafts. Once you get started making the rickrack braid, you will find some great uses for it. We did a blog not long ago about making a chrysanthemum flower with rickrack While you have the rickrack out, you might want to try it. See you soon with more needlework crafts, sewing and stitching fun! Swedish weaving or Swedish embroidery is an old needlework craft that has made a return on the crafts scene. I taught Swedish weaving when I was in 4-H half a century ago, and still do some Swedish weaving on Aida cloth or Huck toweling occasionally. If you can thread a needle and follow instructions, you can do Swedish embroidery or Swedish weaving crafts. You will need an evenweave fabric or Huck toweling, a cross-stitch needle with a dull point, and some embroidery thread. You can make your own pattern or design by marking squares on a grid paper. If you have a renewed interest in Swedish weaving, have some fun with it again, and if you have never tried it, have some fun with a new needlecrafts project. Vintage pillowcases have made a return to recycle crafts and easy sewing fun. There are some great projects that can be made with embroidered pillowcases, even if there is some damage to them. You can make something that will work around the damage. A single pillowcase will make a laundry bag or a purse, or a doll dress for a large doll. Two pillowcases will make an adult apron. 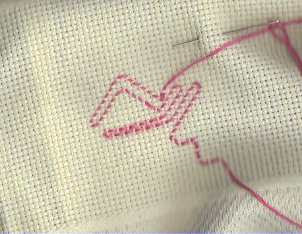 You can also cut the embroidery from a pillowcase and use it on a shirt or blouse. Once you get started, you will run out of embroidered pillowcases before you run out of ideas. 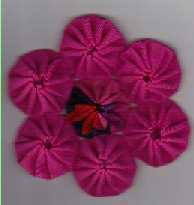 We like recycling crafts projects, and this is a way to save the beautiful embroidery done by others. If your pillowcases are yellow or stained, wash them in Biz or an enzyme pre-soak fabric cleaner. We also wash vintage items in soda. 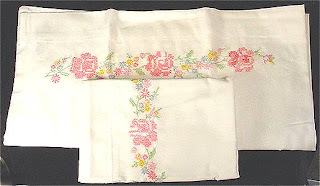 Sodium perborate or Borax is also a product that works to clean vintage pillowcases. See you soon with more sewing crafts, needlework and stitching fun.